On April 15, 2019, the Notre Dame Cathedral’s iconic spire collapsed in a massive fire. The church is one of the most famous structures in the world and a symbol of Paris. This catastrophic fire burned for several hours, and it took above 400 firefighters to contain the blaze. While the devastating occurrence during the Holy Week has upset many devotees across, photos began circulating online of the burning structure. In one of those viral pictures, a woman named Lesley Rowan believes she can spot the outline of Jesus in the flames of the Notre Dame, and social media users unanimously agreed to her seeing God’s son, making headlines worldwide. What Is The Fate Of Priceless Treasures From Notre-Dame Cathedral? Rowan was reading about the tragic incident when she noticed in one of the picture in the billowing smoke that appeared to be the son of God. Taking to social media, she explained that she believed the silhouette to be God’s son, pointing outwards from the inferno sweeping through the historic 850-year-old building. 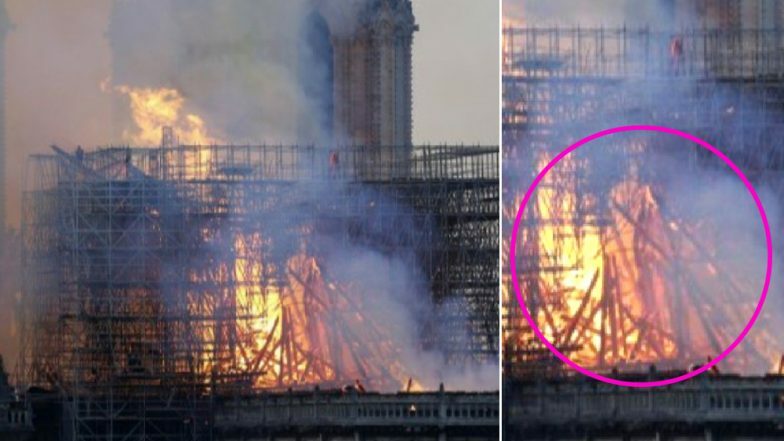 Uploading a circled image of the cathedral, she wrote on Facebook, “I may be letting my mind play tricks on me here, folks take a close look at this picture and what do you see.” Photographer Urges Internet to Find Man and Child Pictured Just Hours Before the Blaze. Most of the people agreed to Rowan saying they see a gown, while others said it could just be a statue and the most cynical said it to be a fire. One of them wrote, “Looks like a figure of Jesus, or I am tripping?” while another commented, “I can see it pretty clear, gown and all. Yeah I saw it straight away - it's Jesus!” Know the History And Facts of Famous French Tourist Attraction Notre-Dame Cathedral. Meanwhile, French President, Emmanuel Macron has announced to re-built Notre Dame Cathedral, within five years and promised to make it “more beautiful than before.” However, there are warnings that the repairs could take decades and will involve substantial challenges. Besides, in just two days after the tragic event, more than 800 million euros (more than Rs 6 thousand crores) reportedly were raised to rebuild the Church.